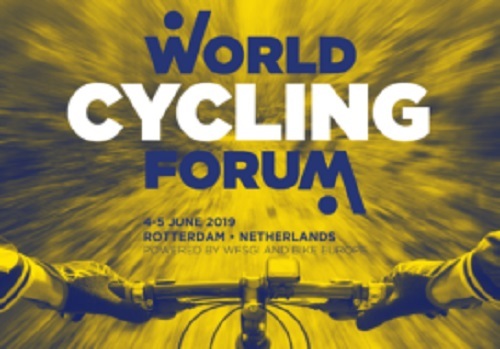 The 2nd World Cycling Forum which will take place in Rotterdam on Tuesday 4 and Wednesday 5 June 2019. Following the successful first World Cycling Forum held in Porto in 2017, the World Federation of the Sporting Goods Industry (WFSGI) in cooperation with Bike Europe will organize the second edition of this International Conference that focusses on the top of the industry. The 2-day International Conference for the cycling industries’ top management take place June 4 and 5 in Rotterdam, the Netherlands. The main theme of the 2019 World Cycling Forum is ‘Putting the Bicycle Industry at the Core of Sustainable Development’. The Forum will focus on the consequences of climate change and the role that the bicycle industry can play in combating those changes. A broader outline of the 2019 World Cycling Forum theme and topics says “International Climate Conferences and national governments are setting ambitious sustainability goals. Goals that can only be met through radical changes. Like doubling the modal share of cycling in the world’s biggest cities. These grand ambitions put the bicycle industry at the core of sustainable development. “But what must the industry do to meet its sustainability potential? What’s needed for manufacturing processes? What kind of materials and technologies can we expect? And what will be the recycling and corporate social responsibility climate? “The 2019 World Cycling Forum addresses these in-depth questions. Don’t miss this opportunity to learn from the answers presented at the forum. Get better equipped to prosper as these massive changes make their impact felt on the bicycle industry.